Public lands are managed for “multiple use” to provide clean water, fish and wildlife habitat, recreation, as well as timber. In Oregon, within the Northwest Forest Plan area, there are 7.1 million acres of National Forests managed by the Forest Service and 2.6 million acres of public land managed by the Bureau of Land Management (BLM). Clearcutting was common on public lands until the early 1990s, when the impacts of unsustainable old-growth logging were finally recognized and protections for fish and wildlife on the brink of extinction were put in place. Since then, clearcutting has not been widely practiced on federal lands for a variety of reasons ranging from inherent controversy to impacts to wildlife habitat. But clearcuts are still allowed on federal public lands in some areas. Federal laws protecting endangered species and clean water on these lands mean that more trees are required to be left behind than on private land, and streamside buffers are much better protected, but the impacts of logging and road building can still be devastating for water, wildlife, and functioning forests. 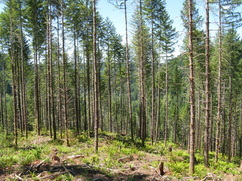 For the last 20 years, the Forest Service and BLM have focused on restoring moist forests and watersheds in western Oregon degraded from past clearcutting, including thinning dense young plantation stands. Such thinning has allowed the agencies to minimize conflict and controversy while also meeting the timber targets under the Northwest Forest Plan as established by Congress. When carefully done, thinning young stands provides ecological benefits by helping develop some characteristics of natural forests more quickly over time. Thinning also produces jobs and wood products as a byproduct of ecological restoration. Unfortunately, federal agencies are facing pressure to move back toward controversial practices, including clearcutting mature forests, largely to satisfy the timber industry’s and some counties’ cry for greater timber volume to solve a complex economic problem. Protecting and restoring forests on federal public lands can be an important tool in combating climate change in Oregon. Learn more! Numerous laws and policies govern the management of federal public lands. Forest Service and BLM lands are subject to the National Forest Management Act (NFMA) and Federal Land Policy & Management Act (FLPMA), respectively, which require comprehensive management plans; as well as the National Environmental Policy Act (NEPA) which requires analysis of environmental impacts, alternatives to a proposed action, and public input. In western Oregon, certain BLM lands fall under the 1937 O&C Act, which calls for timber production and watershed protection. All of these public lands also fall under the guidelines of the Northwest Forest Plan. The National Environmental Policy Act (NEPA) requires all federal agencies to complete an analysis of the significant impacts of logging and associated activities and weigh and consider alternatives to proposed logging plans. The public has the opportunity to comment on documents and participate in agency decision-making. Under the Northwest Forest Plan (NWFP), public lands are divided into different management allocations. In old-growth forest reserves clear-cutting is prohibited. Thinning is allowed in forest stands up to 80 years of age if it is beneficial to the creation of old-growth conditions. 25 live green trees per acre depending on the location. On BLM lands, within “connectivity/diversity blocks” and areas-of-concern for the spotted owl, BLM must apply 150 year rotations for clear-cuts, retain at least 12-18 green trees per acre, and maintain 25-30% of each block in old forest condition. Under the National Forest Roads and Trails Act, federal forest roads are created and maintained to permit maximum economy in harvesting timber as long as such roads meet the requirements for protection, development, and management of the forest’s natural resources. The redesign, reconstruction, non-routine maintenance, or relocation of recreational trails must benefit the natural environment or aid to mitigate and minimize the impact to the natural environment. The purchaser of Government timber is responsible to maintain the roads to a satisfactory condition for environmental benefit. The water resources on federal forestland are subject to the Clean Water Act (CWA). The CWA requires minimal discharge to our nation’s waters. Permits are required for any point source pollution, however, since forestry is considered nonpoint source pollution, the Clean Water Act does not aid in the protection of water damage from forestry. Forestry practices near water resources are expected to follow best management practices. Permits are required for dredge or fill in any navigable water, including wetlands and stream areas in forests. The National Oceanic and Atmospheric Administration (NOAA) Fisheries Division and the U.S. Fish and Wildlife Service (USFWS) share responsibility for implementing Endangered Species Act (ESA) requirements. Any form of “take” or harm to a threatened or endangered fish or animal on federal forestlands is prohibited. Violations result in civil fines up to $25,000, criminal penalties of up to $50,000 and/or one year’s imprisonment per violation. Exemptions exist through permits for certain activities that affect threatened species. A habitat conservation plan (HCP) is required to obtain this type of take exemption permit. Land managers must consult with fish and wildlife biologists before conducting activities likely to adversely affect listed species such as northern spotted owls & marbled murrelets. Under NWFP Aquatic Conservation Strategy (ACS), Riparian Reserves are intended to protect both aquatic ecosystems and to provide a network of habitat “stepping stones” so that terrestrial wildlife can move across the landscape. The ACS provides for no-cut stream buffers based on biological and hydrological criteria. Buffers are typically 340 feet for fish-bearing streams, and 170 feet for non-fish bearing streams. The Clean Water Act also requires a buffer width of 75-150 feet in which vegetation and trees are undisturbed. Selected trees presenting unusual hazards may be cut. Any application of insecticides near watersheds or in riparian buffers is prohibited. A limited list of certain chemicals are allowed on public lands, but are generally used sparingly and applied manually to control noxious weeds. Aerial spraying and use of chemicals to control competing native vegetation on order to boost timber production is not allowed. Forest Service employees are responsible for monitoring federal logging and other activities. The public has a right to hold federal agencies accountable for compliance with federal environmental laws.